When just FileBoss's main window is hidden clicking the button on the progress dialog will display it again. And when everything is minimized to the system tray clicking the FileBoss's icon will restore FileBoss's application window and the progress dialog. Whether FileBoss is minimized or hidden it will be fully restored when the copy operation completes. All the dialogs for copy based actions have a Hide FileBoss check box near the bottom of the dialog. When this is checked and the copy operation starts FileBoss will be hidden so that only the progress dialog is displayed. 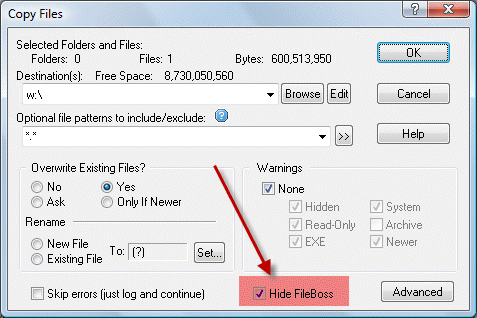 The Hide FileBoss setting is remembered along with the other settings in the dialog. The progress dialog as shown below now has two button for hiding and showing FileBoss's main window (on the top-left) and minimizing both FileBoss and the progress dialog to the system tray (on the top-right). When FileBoss is just hidden, the left button can be used to display it again and when FileBoss and the progress dialog are minimized they can be displayed by clicking on the FileBoss icon in the system tray (normally at the bottom right of your screen). In addition to the Hide FileBoss check box on the copy dialogs FileBoss can also be hidden using double slash meta commands placed in the same field as the destination folder(s). W:\ ; V:\ //hidefileboss, W:\ ; //hidefileboss V:\ and //HF W:\ ; V:\ will all produce the same result, i.e. hide FileBoss's main window while still showing the progress dialog. Meta commands override the settings in the dialog box at all times. The difference between using these meta commands and using the check box on the dialog is that they are instance specific, in other words you can specify that FileBoss be hidden only on copy operations you know will take a long time while leaving the default to not hide FileBoss.